Nystatin is an antifungal antibiotic. Nystatin is used orally for the treatment of intestinal candidiasis. In patients with coexisting intestinal candidiasis and vulvovaginal candidiasis, nystatin has been administered orally in conjunction with intravaginal application of an antifungal agent. While early studies provided some limited evidence that, by reducing intestinal candidal colonization, combined oral and intravaginal antifungal therapy possibly could improve the mycologic response and reduce the recurrence rate of vulvovaginal candidiasis, most evidence suggests that combined therapy does not substantially reduce the risk of recurrence compared with intravaginal therapy alone. Nystatin has been administered orally as a suspension in conjunction with local application of the drug for the treatment of candidal diaper dermatitis. The majority of infants with candidal diaper dermatitis harbor C. albicans in their intestines, and infected feces appear to be an important source of the cutaneous infection. Candidal diaper dermatitis usually is treated with topical antifungal agent therapy (e.g., topical nystatin, amphotericin B, miconazole, clotrimazole). In addition, some clinicians recommend that an oral antifungal agent such as nystatin be administered concomitantly to treat the intestinal infection. Despite the fact that results of 2 small studies have not provided evidence that concomitant oral and topical therapy is more effective than topical therapy alone, some clinicians suggest that such a strategy may be warranted. Nystatin is not effective in the treatment of systemic candidal infections. Although oral nystatin has been used for prophylaxis against initial or recurrent mucocutaneous candidiasis in individuals with human immunodeficiency virus (HIV) infection, the drug is not included in the current guidelines of the Prevention of Opportunistic Infections Working Group of the US Public Health Service and the Infectious Diseases Society of America (USPHS/IDSA). The USPHS/IDSA currently states that primary prophylaxis to prevent first episodes of mucocutaneous candidiasis in HIV-infected adults, adolescents, infants, or children is not recommended because acute mucocutaneous candidiasis generally is treatable and rarely life-threatening and because of concerns about the potential for development of resistant Candida, possibility of drug interactions, and cost of antifungal prophylaxis. However, chronic suppressive or maintenance therapy (secondary prophylaxis) may be indicated in HIV-infected individuals with a documented history of frequent or severe episodes of mucocutaneous candidiasis. If suppressive or maintenance therapy against mucocutaneous candidiasis is indicated in HIV-infected adults, adolescents, infants, or children with frequent or severe recurrences of oropharyngeal, esophageal, or vaginal candidiasis, the USPHS/IDSA recommends oral fluconazole as the drug of choice and itraconazole oral solution as an alternative. Oral nystatin (tablets and/or suspension) has been widely used in various regimens for prophylaxis against candidal infections during periods of iatrogenic neutropenia in patients receiving immunosuppressive therapy (e.g., patients with malignancies, transplant recipients) with variable results. Use of primary antifungal prophylaxis against candidal infections in nonneutropenic patients or neutropenic cancer or transplant patients is controversial, particularly since such prophylaxis may predispose the patient to colonization with resistant fungi and/or result in the emergence of highly resistant organisms. Many clinicians state that routine primary prophylaxis with antifungal agents in such patients is not recommended, but may be considered in certain carefully selected high-risk patients (e.g., solid organ transplant recipients, patients in institutions that have a high incidence of fungal infections). If primary prophylaxis against candidal infections is used in cancer or transplant recipients, many clinicians recommend use of oral fluconazole. While there is some evidence that oral nystatin prophylaxis may reduce the incidence of mucocutaneous candidiasis in some neutropenic patients, it is unlikely that the drug would decrease the frequency of invasive candidiasis. Results of a study in adult and pediatric liver transplant patients randomized to receive antifungal prophylaxis with nystatin oral suspension or oral fluconazole indicate that fluconazole may be more effective than nystatin in this patient population since Candida infections developed in 27% of those receiving nystatin and 12% of those receiving fluconazole (intent-to-treat analysis). Superficial candidal infections or documented systemic invasive candidal infections developed in 25.3 or 6%, respectively, of those receiving nystatin and in 10.5 or 1.3%, respectively, of those receiving fluconazole. Nystatin is administered orally for the treatment of intestinal candidiasis. The oral powder for suspension is intended for extemporaneous preparation of a single dose at a time since it contains no preservatives. For the treatment of intestinal candidiasis (with or without coexisting vulvovaginal candidiasis), nystatin is given in dosages of 500,000 to 1 million units 3 times daily. The drug should be administered for at least 48 hours after clinical cure to prevent relapse. As an adjunct to topical nystatin therapy for the treatment of candidal diaper rash, the drug has been administered as an oral suspension in a dosage of 100,000 units 4 times daily. Adverse effects occur infrequently with oral nystatin therapy. Mild and transitory nausea, vomiting, GI distress, and diarrhea have occurred; high oral doses (e.g., greater than 5 million units daily) are most likely to produce these adverse GI effects. Hypersensitivity reactions have been reported very rarely. Nystatin is contraindicated in individuals who are hypersensitive to the drug or any ingredient in the respective formulation. If irritation or sensitization occurs, nystatin should be discontinued. Studies have not been conducted to date to assess the mutagenic or carcinogenic potential of nystatin in humans or animals. Animal reproduction studies have not been performed with nystatin, and it is also not known whether the drug can cause fetal harm when administered to pregnant women. Nystatin should be used during pregnancy only when clearly needed. Studies have not been conducted to date to determine whether nystatin affects fertility in males or females. Since it is not known whether nystatin is distributed into human milk, the drug should be used with caution in nursing women. Nystatin exerts its antifungal activity by binding to sterols in the fungal cell membrane. The drug is not active against organisms (e.g., bacteria) that do not contain sterols in their cell membrane. As a result of this binding, the membrane is no longer able to function as a selective barrier, and potassium and other cellular constituents are lost. 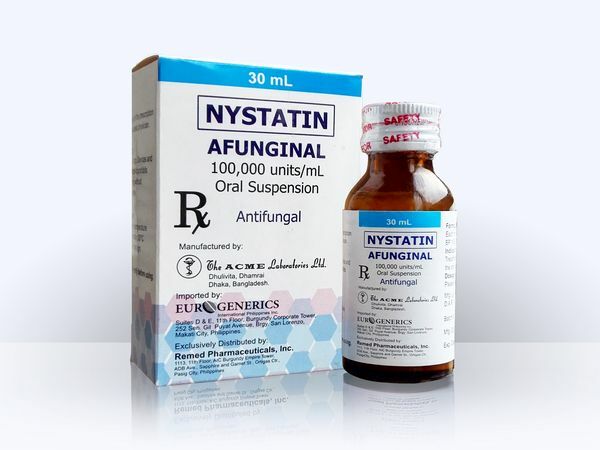 Nystatin has fungistatic or fungicidal activity against a variety of pathogenic and nonpathogenic yeasts and fungi. In vitro, nystatin concentrations of approximately 3 mcg/mL inhibit Candida albicans and C. guilliermondi. Concentrations of 6.25 mcg/mL are required to inhibit C. krusei and Geotrichum lactis. In general, there is little difference between minimum inhibitory and fungicidal concentrations for a particular organism. Nystatin is not active against bacteria, protozoa, or viruses. Candida rarely become resistant to nystatin in vivo. When resistant strains appear, they frequently are also resistant to other polyene antifungal antibiotics. 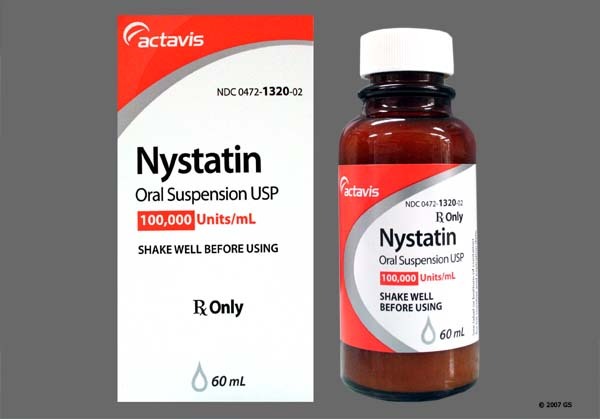 Nystatin is poorly absorbed from the GI tract, and detectable blood concentrations are not obtained after usual doses. Following oral administration, nystatin is excreted almost entirely in feces as unchanged drug. The drug is not absorbed from intact skin or mucous membranes. 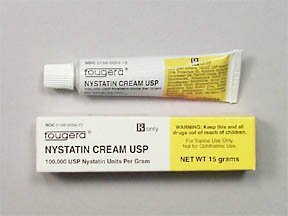 Nystatin is an antifungal antibiotic produced by Streptomyces noursei. The drug is an amphoteric polyene macrolide that occurs as a hygroscopic, yellow to light tan powder with a cereal-like odor and is very slightly soluble in water and slightly to sparingly soluble in alcohol. Each mg of nystatin contains not less than 4400 units of activity. Nystatin deteriorates on exposure to heat, light, moisture, or air. Nystatin oral suspension and tablets should be stored in tight, light-resistant containers at room temperature (e.g., 15-30°C); exposure of the tablets to temperatures exceeding 40°C and freezing of the oral suspension should be avoided. Nystatin powder should be stored in tight, light-resistant containers and refrigerated at 2-8°C. 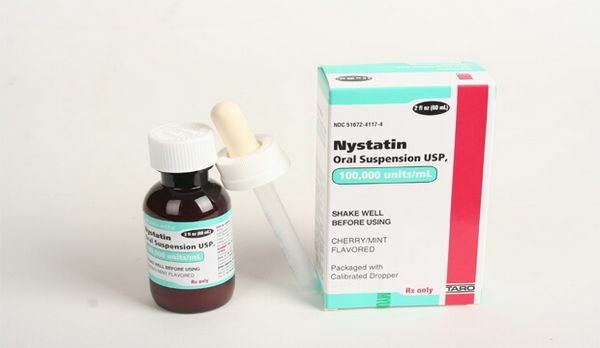 Since extemporaneously prepared oral suspensions of nystatin do not contain a preservative, such suspensions should be used immediately after preparation and should not be stored.